Born in Haikou in the 1980s, Wang Luqing is the founder of 1921 Huan Ke, a boutique hotel in Haikou, Hainan Province. He wants to use his hotel to convey ideas on simple lifestyles and universal concepts. I was born in Haikou, Hainan Province. I still remember that when filling out college applications in 2002, my parents urged me to choose a university in Hainan Province even though my dream was to see the world outside the island. Eventually, I was admitted to Yantai University in Shandong Province. At the time, I was very happy to say goodbye to Hainan. After graduating from college, I started working on project management for a company in Guangzhou, Guangdong Province, hoping to build a world of my own. I traveled a lot during my spare time. I have always enjoyed traveling since I was young, but seldom found chances to do so because of economic limitations. So, during my four years in college and my spare time after work, I got out a lot. During my travels, I became interested in the design, construction and management of tourist attractions and hotels. I met many veteran professionals with unique insights that would greatly inspire my future business in the hospitality industry. One day in 2011 on my way home from work, I opened the sunroof in my car to be greeted with a blue sky and white clouds. I was thrilled. I thought to myself: “What happened to you? If you go back home, you will enjoy blue skies and white clouds all year around. Why weren’t you ever so excited there?” At that moment I knew that I missed my hometown and that I had been away for too long. I thought about it all night and ultimately decided to return to my hometown. At the time, the concept of boutique hotels was hardly known to the people of Haikou, but I believed such a business might have a good chance in my hometown. Haikou’s blue skies, fresh air and unique lifestyles are hard to find elsewhere. Even though incomes are higher outside, Haikou people understand that life is not all about work. I wanted to share my understanding of life with more people by launching a boutique hotel. I received a lot of positive feedback and support when I shared the idea with my classmates and family. In 2012, I began to prepare to start the business together with several of my friends. I teamed up with college classmates and friends who won the China Design Award, specialized in corporate planning or were experienced in management. My team has 26 members today. Some core team members, however, do not live and work in Hainan, which has proved a good way to provide a constant source of good ideas from around China and the world to improve the business. We built a boutique hotel by renovating two old buildings with designs unique to coastal areas of Fujian and Hainan and named it 1921 Huan Ke. Today it offers 24 rooms, each with a tailored, poetic name. The names are actually part of a poem. “Huan Ke” is a term used by Hainan natives to refer to those who returned to their motherland after living for some time particularly in Southeast Asia. The year “1921” was the zenith of trade between Haikou and Southeast Asia. Traces of those good old days can be seen in almost every component of 1921 Huan Ke: bricks, tiles, walls and pavilion in addition to old furniture, memorabilia, classic doorways, arches and the vintage front desk. Alongside 1921 Huan Ke, we are working on another project near Haikou Airport. I want to use this hotel to remind consumers of the simple lifestyles and concepts that were once essential and to encourage everyone to discover the beauty around them. 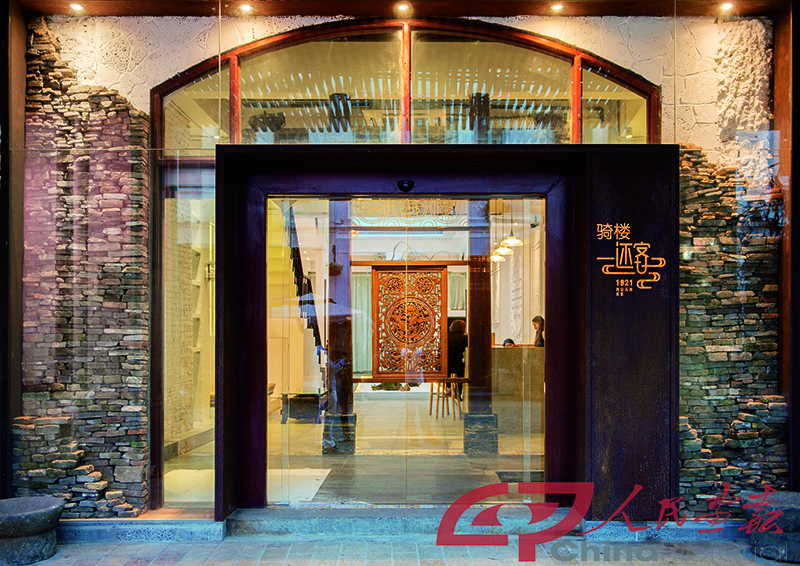 The gate of 1921 Huan Ke, a boutique hotel with a historical flavor.